Legal Pluralism – cui bono? An important part of the narrative of modern law and legal science has been the claim that legal unity possesses many advantages over the legal pluralism of earlier periods. 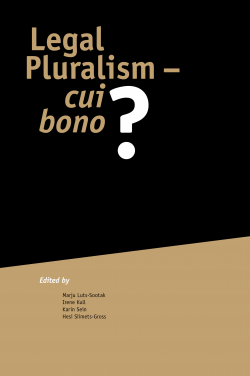 This collection includes articles from the conference “Legal Pluralism – Cui bono?” organised by the School of Law in the University of Tartu in 2015. The conference papers not only identify the real dangers and challenges, but first of all the opportunities of legal pluralism and concentrate primarily on the perspective of the individual historically as well as in the present. The volume includes papers by Piia Kalamees, Katrin Kello, Olja Kivistik, Irene Kull, Kåre Lilleholt, Marju Luts-Sootak, Patrick Praet, Ralf Seinecke, Hesi Siimets-Gross, Maarja Torga, and Age Värv.